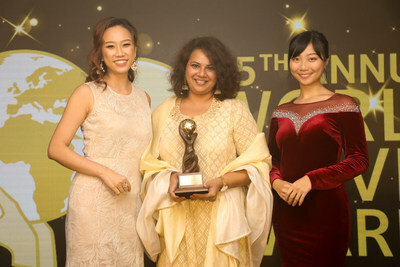 Deccan Odyssey, India’s leading luxury train made history at the World Travel Awards (WTA), after being named as Asia’s Leading Luxury Train for the 5th time in a row. The country’s premier luxury train is known for its majestic journeys and exemplary service. The winners of the prestigious award were announced at a glittering ceremony held at the Intercontinental Grand Stanford Hong Kong on 3rd September 2018. The only luxury train in India that traverses through all the major tourist destinations, Deccan Odyssey is also a gateway to the little known cultural secrets of the country. In the palatial train, one discovers more than one facet of India on any of its six enchanting journeys. The moving palace takes passengers through Maharashtra, Gujarat, Karnataka, Rajasthan, Andhra Pradesh, Goa and Delhi depending on their choice of itinerary. The train is also home to four resplendent Presidential Suites with exquisite decor and all modern amenities. The two gourmet restaurants, Waavar and Utsav on board help the guests taste the local specialities of each of the very diverse states that the train makes its way through. These are supplemented by a full bar, a lounge even a spa and a beauty salon. The royal train also boasts of unique features and amenities such as 24*7 Wi-Fi connectivity, cell phones & LCD TVs in every cabin. The World Travel Awards is considered by many as the ‘Oscars of the Travel Industry’ that celebrate excellence in global tourism. Deccan Odyssey has 21 coaches, out of which 12 are passenger cars that can accommodate 8 people per coach (10 passenger/ deluxe Cars, 4 coupes per coach – 2 Presidential Suite Cars, 2 coupes per coach), 1 Conference/ Entertainment Car, 2 Dining Cars, 2 Generator Cars with Luggage Store, 2 Staff Cars, 1 Spa Car, 1 Bar Car. The capacity of the train is 88 passengers.